First off, congratulations on your advancement to the Ro16. Tell us how you feel. I’m not sure if because it was such a difficult victory or what but I am both tired and glad. It took a while. They were difficult matches. Were there any problems playing on the EU server from Korea? Currently, MC is in Europe so I played around five games with him on the EU server before my matches began. Practice seemed very doable so I figured I’d be okay. But when I went to the lobby to get ready for my match, I noticed that about 10,000 spectators were there. I’m not sure if it was because there were so many people there to watch but my reaction timing was really slow. Microing was difficult for me so rather than go for multiple engagements I decided to just try to end my games with one bang. Rather than your normal defensive mech plays, you showed us your bionic strategic plays. Any special reason behind that? No specific reason really. I just decided that bio was working out more than mech was for me. I had a strategy all planned out as I was laddering today. And I decided to use that specific strategy against DIMAGA. The strategy was aimed at taking him out with one hit but the lag resulted in me being unable to burrow all my widowmines at once and they also moved a little too far ahead. It was the same thing with EMPs. I shot off my EMPs after my opponent’s army had already moved out of the way. That was pretty much my situation (laughs). So I really couldn’t pull off anything that I had prepared. If you had to evaluate today’s matches? For my first opponent, Siw, I felt like our skill difference was really large. However, DIMAGA and Socke are players that I have heard about since the WoL days so they weren’t easy. I also think I was a little out of it because it was so early in the morning. Honestly, I don’t think my true skills came out. You took a complete loss against DIMAGA in the winners’ round. DIMAGA turned out to be excellent at hitting ultralisk timings and at controlling them. It’s the most dangerous timing for a Terran player so things just got more and more difficult as he just kept on breaking through. In the final match, you started off with a loss against Socke. It seems like you took a lot of damage from his dark Templars. I did not anticipate the DTs at all. And I think that’s why I took so much damage. All the casualties from the DT harassment made me realize that he had probably already won that game. Games two and three however, saw some real effects from your medivac plays. Seeing as how I was playing on the EU server, I decided it would be wise to just avoid any engagements. I was sure that I would end up makings things worse for myself if I tried to take on any battles. I guess it could be seen as me making an excuse but I just did not like how my micro was going. I’m not sure if it was because I decided to just go for one big game ending bang but it turned out that my opponent just didn’t defend against my attack. After I noticed that, I decided to just keep on going with that. You will play the Ro16 while actually in Europe. After playing today, I can’t help but feel like I should go to Europe the next time I have to go through a Ro32 again. Since the matches were so difficult this time, I want to try to have an easier road next time (laughs). Has your flight date already been decided? It hasn’t been decided yet. After I get some sleep, I’ll talk about it with the supervisor tomorrow. I want to thank the fans for tuning in even though it was so early in the morning. I have to play the rest of my WCS matches from Europe but I will make sure I work real hard and make some good results for this first season and respond to all my fans’ encouragement. You advanced to the quarter-finals as second from group C. Tell us how you feel. This was my first WCS match while being in Europe so I am glad that I was able to advance to the Ro8 like this. But I am a little disappointed about losing in the winners’ round. What kind of results were you expecting after seeing your Ro16 group for the first time? I was anticipating that I would get out of my group as second. And I think I was able to do just that because things went better than expected. Before the matches began, I studied LucifroN’s replays and VODs a lot and that’s how I was able to realize that he was an excellent player. So I expected to have a lot of difficulty if I ended up facing him. Right now I’m constantly spending time with MC so my TvP practices are going well but it is difficult to practice against Zergs and Terrans. So that’s why I was seeing myself advancing out as second. In your match against SaSe, you went for a marine/tank harassment play after your reaper scout. Was this planned out? That’s right. I looked at a lot of SaSe’s replays and I also decided that tanks were the right way to go after practicing with MC. I started off with reapers in the beginning so that I could safely progress through the mid-game. Did you know about SaSe’s plan to play with a 3 gate 1 robo build? SaSe’s style is to pretty much stick with what he knows how to do. So I was able to comfortably play against him because I was aware of this fact. In your winners’ match against LucifroN you took on a lot of damage because of hellbats. It looked like you just weren’t expecting it. I already knew about his hellbat usage because I watched his previous games but I really didn’t play against any hellbat timing attacks during practice so I had difficulty responding to it. So my reaction timing was slow. It looked like your third command center timing was rather quick during your TvTs. I didn’t really have any specific builds prepared for my TvTs so I just went with the usual. I was aware that LucifroN liked to use hellbats but I also wanted to experience falling victim to it. Rather than try to respond to what he was doing, I wanted to play normal and find out what kind of timings he liked to do. Taking on a lot of drop plays from game one must have been why you had supply depots at your cliff and Vikings. However, you still lost in the late game. I couldn’t think properly because I was so focused on the drops. I think I made bad results because the little things he kept on doing just kept on adding up. It almost felt like LucifroN was a level above me. Your feelings on LucifroN who took you out? It feels like his build orders are that of a European player’s but his play style is identical to that of Koreans. I also think that his skill level is also identical to Koreans. Who did you want to face in the final round? I didn’t really care who I faced. 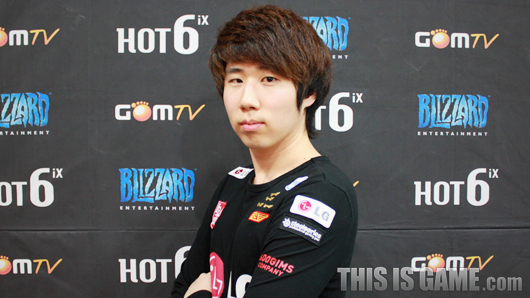 I had already beaten SaSe and I was confident in my TvP because of my practices with MC. Regarding Nerchio, I saw his games vs LucifroN and I pretty much assumed I was going to win easily because his performance was not that great. I had pretty much figured that I had already advanced to the quarter-finals regardless of the results from the winners’ round. In game one of the final round against SaSe your attack line that surround SaSe ended up crumbling. When I was checking out my surroundings, I had a second expansion up and SaSe didn’t so I had a feeling that I would come out on top in the macro game. My strategy would have guaranteed a victory had my attack line not fallen. You won game two with drop plays and dealt a lot of damage. When did you know that you had won? I think it was around the time I attempted the double drop. I noticed that he defended very late against my double drops. I realized that his focus had broken at that moment so the rest of the game progressed pretty comfortably from there on. You played the Ro16 actually from Europe. Was anything different from your usual overseas tournament experiences? Currently, the WCS format for EU is the same as the one for KR. However, playing the KR format in EU was a very refreshing feeling. Several times, I endured a lot of difficulties whenever I went overseas for a EU tournament because it always lasted for only about 3 – 4 days. Being able to take long and deep breaths like this during a EU tournament is a first for me. How has your time at Europe been so far? I am having a relaxing time because I am with Reis hyung and MC. I also like the fact that I can enjoy Korean meals here. It almost feels like I’m not even overseas. How did you think the quarter-finals will go? I don’t know who my opponent is going to be yet so I don’t really know but there is a lot of time to prepare so I think I am more than capable of grabbing the victory. How do you plan on preparing for the quarter-finals when you previously stated that you have no Zerg and Terran practice partners? There’s a lot of latency issues with practicing with the KR players so I really don’t know. I’ll have to either look for some EU practice partners or practice with the KR players on the NA server. With your quarter-finals placement you qualify for next season’s Premier League. I think I’m going to be able to approach the rest of my games with ease from here on out, now that I know I secured my spot for next season’s Premier League. I also have a better win percentage for the Ro8 and onwards rather than the Ro32 and Ro16 so I feel confident. Recently, a lot of people have been saying that Mvp’s play style is not the same as it once was. Why do you think this is so? I think it’s because I’m just not as good as I used to be. Rather than say that I’m not adapting to HotS properly, I think it’s just more of the fact that I haven’t been practicing as much. I think I’m not improving right now because I keep on laddering rather than focus on a specific thing as I prepare for tournaments. Before the whole WCS thing, there was a time where I wasn’t putting up any results and couldn’t focus during practice while I was in Code B. I also had no motivation at that time because there were no upcoming tournaments to look forward to. But right now there are a lot of tournaments I can participate in so I think my issues have been somewhat resolved. Any plans to return to Korea? I’ve scheduled a flight to return to Korea once the WCS finals are over. Because of that, I really want to make it to the finals no matter what (laughs). Right now, my goal is to get to the semi-finals so that I can qualify for the season finale. I want to achieve that no matter what. These days, the supervisor has been losing more weight and he’s been struggling. I really hope he remains strong. I really wish things would just go smoothly so his wife will also be able to relax a little. I want to thank my fans in Korea for cheering me on and my girlfriend for cheering me on heavily. The day after tomorrow, NesTea hyung and MLG manager, Hwanni, will be heading overseas together so I hope they stay safe and have a good trip. Methods to locating SC2 interviews! 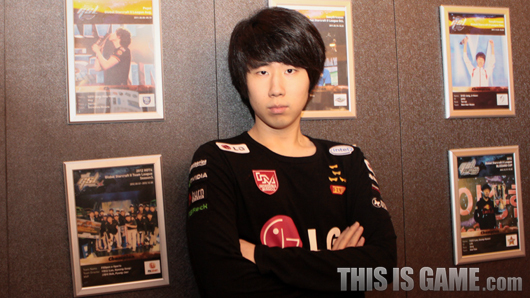 oh they did WCS EU interviews for MVP? cool. Been a while since an Mvp interview, Thanks for the translation! No promises. I'll see what I can do. Thanks for all the additional info about finding interviews as well, Seeker, very helpful. Mvp with some high praise of LucifroN! any info about his wrist? "A man is what he chooses to be"